This gladiator was not just a gladiator in the typical sense but a skilled archer. Armed with a bow and arrow the Sagittarius would enter and fight in the amphitheatre on horseback. Similar in many ways to the essedarious gladiator who fought from a chariot, the sagittarius was something of a unique class and fought against other gladiators who were on foot. In many ways the matches involving the sagittarius would likely have not been considered fair fights, but perhaps something more of a showing of this archers skills or a mock battle for entertainment value. It’s thought that it was common for the sagittarius to face off against one or more gladiators, who while on foot could have outnumbered the sagittarius. There is also mention of the amphitheatre being adorned with rocks, trees and bushes to provide cover to the gladiators facing the sagittarius, which would have evened the odds somewhat. A saggitarius gladiator practicing his archery skills outside of the arena. The sagittarius gladiators were armed with a short bow, typically used by the barbarians, the Germanic warriors and tribes of northern Europe. 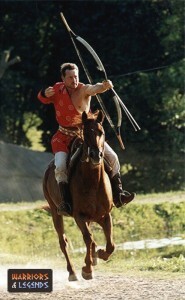 This bow was short but powerful, easy to use while riding on horseback but capable of generating a lot of force. It is thought that the sagittarius gladiator wore scaled or chain mail armour into battle, but fought without a shield as their weapon the bow would require both arms to use it. The need for this gladiator to be armed was minimal, if the fight ended up on the feet, with them against many opponents, armour might not even aid them. The sagittarius gladiators were expert archers, and their time in the amphitheatre was an opportunity for them to show their skill. Their mastery of horseman ship would also be on show here, as they used their unique skills to effectively pick off, and to avoid the gladiators that were fighting them on foot in the arena. Skill and accuracy were the most important factors for the sagittarius to win in the amphitheatre. Fighting in what many would say were mock, or showcase fights the sagittarius gladiators were nonetheless very skilled fighters. These gladiators were capable of riding on horseback and picking off their opponent with their bow and arrow with expert weapon ship.